Most people will never have to deal with a gunshot wound, either as patient or as rescuer. Many paramedics go their entire careers without treating a single firearm-related injury. But when it happens, you don't want to be learning what to do in the moment. Learn what to do in the case of an active shooter before it happens. Get to safety! You can't help anyone if you get hurt yourself. If the patient can walk or run, take them with you. In the case of an accidental shooting, make sure the gun is secured. Once safe, call 911 and follow the instructions from the dispatcher. Pressure is the most important thing. If blood is coming out of a hole, put a lot of pressure on it. For particularly bad bleeding, don't be afraid to use your knee and really lean on the wound hard. Use a dressing (gauze, towels, shirts, etc.) Dressings help the blood to clot and seal the wound. Use a tourniquet if you can. Professional tourniquets are great, but using them properly takes practice. It should be very uncomfortable if it's on correctly—maybe even painful. Improvised tourniquets fail often. So, if you don't have a commercial version, just hold pressure and really lean into it. Gunshot wounds are unpredictable puncture wounds that can cause major tissue damage. Three separate factors work together to determine the severity of a gunshot wound. While all three factors impact the shot, changing the speed of the bullet makes the most difference to the amount of damage done by the round. Handguns produce significantly slower velocity projectiles than rifles, and therefore typically cause less severe injuries. That's not to say that handguns are not dangerous, just that rifles cause bigger holes. 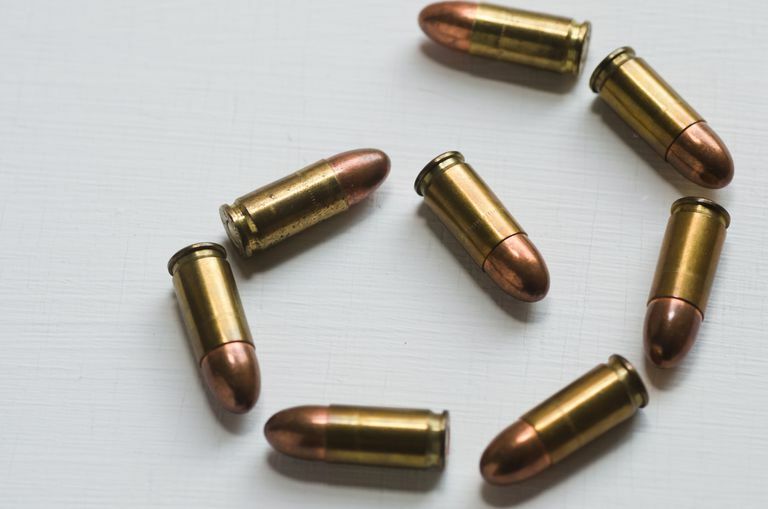 Bullets can bounce around the inside of a patient. A gunshot wound on one side of the body that lines up with a gunshot wound on the other side of the body may or may not be connected by a straight line. Various dynamics affect the path around may follow. The tissue damage (overall injury) caused by a projectile is determined by multiplying the mass (weight) of the round by the velocity of the round squared. Since the speed of the round is squared in this equation, doubling the speed quadruples the energy and the damage. Do not elevate legs to treat for shock if the gunshot wound is above the waist (unless the gunshot wound is in the arm). Gunshot wounds to the abdomen and chest will bleed more quickly once the legs are elevated, making it harder for the patient to breathe. Let conscious patients sit or lie in a position most comfortable for them. Unconscious patients should be placed in the recovery position. Never give the patient anything to eat or drink, including water. Surviving a gunshot wound depends greatly on how quickly a patient gets to a hospital. Ideally, a gunshot wound patient should be on the way to a hospital in an ambulance within 10 minutes of being shot. Gunshot wounds are puncture wounds and are typically treated the same. Don't expect to be able to tell the difference between entrance and exit gunshot wounds. There's a myth that one type is significantly worse than the other. There's no reliable way to tell and it doesn't matter.